Over my several years of trail and ultra running, I have experimented quite a bit with shoes of all makes and models. While I continue to try out different things, I have seen myself gravitating toward one brand, La Sportiva. I think this is in large part due to having a narrow foot, an area in which La Sportiva’s traditionally excel. While I have several La Sportiva models that I rotate between, a long distance (50+ miles) shoe has been elusive. I had hopes with the Ultra Raptor, but a couple of design shortcomings (in my opinion) left me unsatisfied. Enter the Wildcat. La Sportiva bills this shoe as ideal for training or long runs, so it caught my eye as a potential candidate for my longer runs. With the release of their new version, the 3.0, I decided to give it a try. 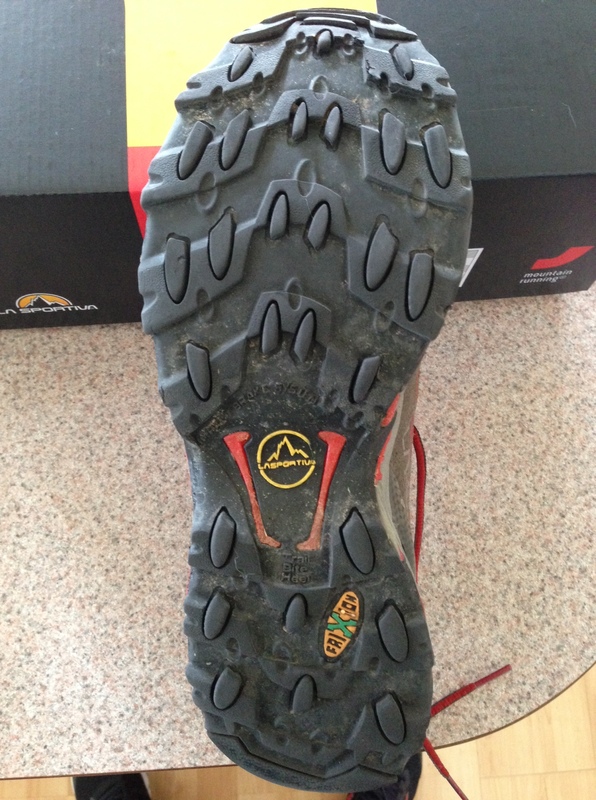 A little caveat, I have not run I the Wildcats before, but have run in most of the other La Sportiva models. As such I will review them as a standalone shoe and in comparison to other La Sportiva’s, but will not make and comparisons to previous versions of the Wildcat. DISCLAIMER: I am in no way affiliated to La Sportiva at the time of this review, however, La Sportiva did provide me with a pair of these shoes for the purpose of evaluating and reviewing them. As always, I will do my best to maintain an unbiased stance for this review will highlight both positive and negative aspects. Straight from La Sportiva’s product page, the shoe is “designed for off-road running, ideal for training sessions & longer runs thanks to its plush cushion & comfortable fit.” Let’s see if it lives up to this description. Out of the box, these shoes live up to the claim of being well-cushioned. The cushioning is definitely plush, however, the outsole is a bit stiff, clearly indicating the need for some degree of break-in (about 25-30 miles based on my experience). 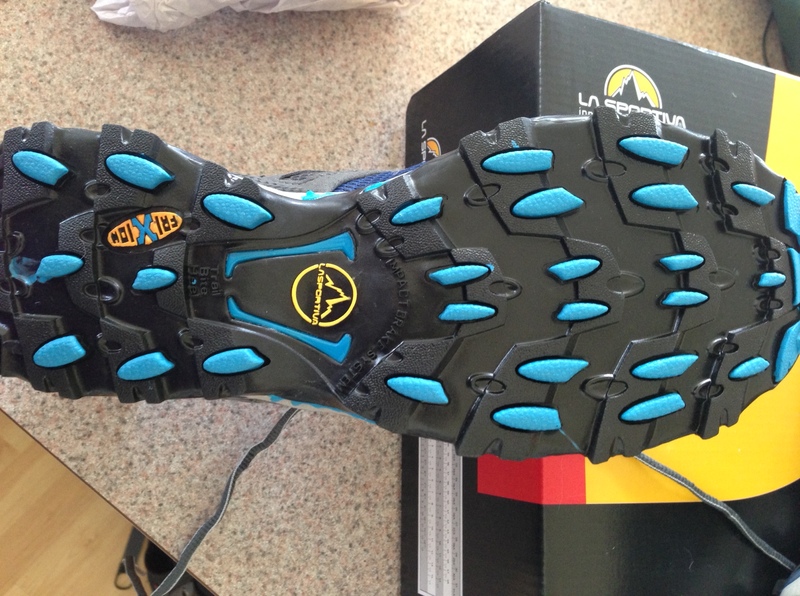 The upper is comfortable and snug, yet a bit wider than most La Sportiva’s, giving the toe box a bit more room. If you look at the pictures below, you will see a lot of similarities with the Ultra Raptor. My biggest complaint with the Ultra Raptor and the one that ultimately made me abandon them is the barely padded leather heel cup, which caused blisters almost immediately whenever I ran uphill. I was encouraged to see that the Wildcat had a well-padded cloth heel cup. As you can see from the pictures, the Wildcat uses the same outsole as the Ultra Raptor, which is promising. I have been running almost exclusively in the Wildcats for the past 2 1/2 weeks. Below, you will see the detail of several runs I made in these shoes along with observations from each run. I attempted to run on several different course types and conditions to be able to provide a well rounded opinion of the shoe. while the test runs listed below don’t represent all of my runs, they highlight those that featured different terrain and conditions. This was my first run in the Wildcat 3.0 and it was a good one, getting a chance to test it out on a technical trail with a solid elevation profile. For added bonus, throw in some rain, wet trail conditions, and even a little bit of snow. The shoes were as comfortable as advertised, with a very cushiony feel. They felt good and stable under the feet, although were quite a bit rigid, which I am hoping is just because they need a little breaking in. The wet conditions were a good test to see how well the shoes drained water, which I would say is above average…my feet, while wet, rarely felt drenched. The grip on the outsole was where I was most pleasantly surprised. I had next to no slippage on the wet rocks and muddy trail. These are CLOSE to being on level footing with the Bushido in this respect. We also crossed a snow field where these shoes may have even surpassed the Bushido in snow, especially when climbing. They were fantastic. They did seem a bit heavy and sluggish, particularly on the short flat sections we were on, which is an expected trade-off when going with a heavier shoe. With this run, I wanted to test the performance of the Wildcat when transitioning between pavement and trail. This was especially important because while La Sportiva shoes are popular for their mountain running, they aren’t generally a high performer on pavement. This route began with 0.75 miles on pavement, followed by 3.5 miles on trail, ending with 2.25 miles on pavement. I found no issues with the feel or comfort on the pavement and would rate these on the higher end in terms of pavement running within the La Sportiva line. They handled well on the pavement and transitioned to trail smoothly. The trail on this route was non-technical and sandy, but the sand didn’t seem to be a problem either. On the last stretch, I was able to open it up a bit and run a comfortable 7:00/mile. Similar to my first run, they are a bit sluggish on the flats, and pavement is no exception. I definitely had to work harder to maintain this pace versus most other shoes, but given the weight of the shoe, that is to be expected. This run was the true test, a long run on some of the steepest and most technical terrain that the Wasatch has to offer. This run covers portions of the Speedgoat 50K course, the most difficult 50K in the U.S. I am not a strong downhill runner in steep conditions, so with this run, I was looking for two things: grip on the downhill and durability/comfort on the long runs. Once again, I was satisfied with the Wildcats. My downhill pace was a bit faster than normal because I did not feel like I was slipping at all, despite the dry, loose dirt. This gave me a bit more confidence to speed up a bit. In terms of comfort, they definitely did the job. At the end of the run, no blisters, no hot spots, etc. They performed so well in fact that I am on the fence about changing my plan and wearing these for the full Speedgoat! This shoe lives up to the bill of being a well-cushioned shoe. Even on extremely technical trail, these shoes did a great job at preserving my legs. I could definitely see using these on longer race days. The grip was amazing, particularly in muddy/snowy terrain. They also performed well on dry/loose dirt. 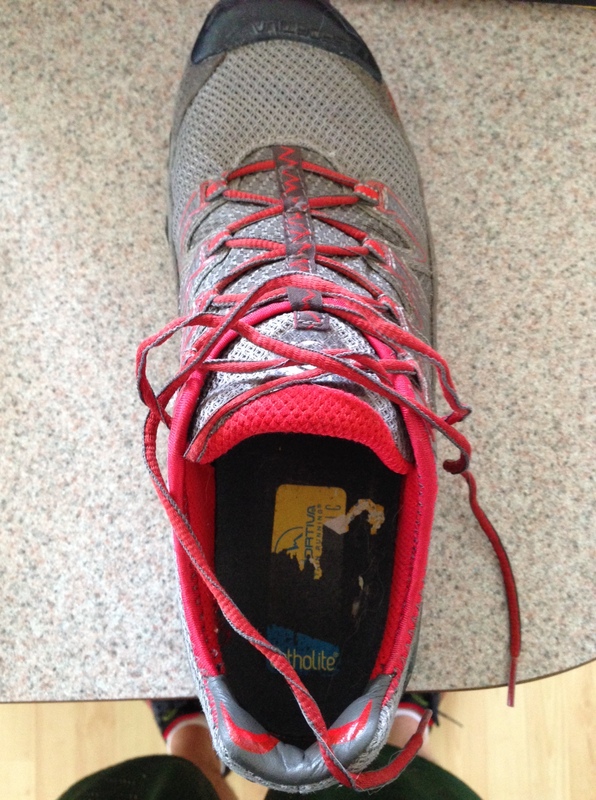 The grip improved a bit more after about a 25-30 mile break-in period when the outsole had a bit more flexibility. 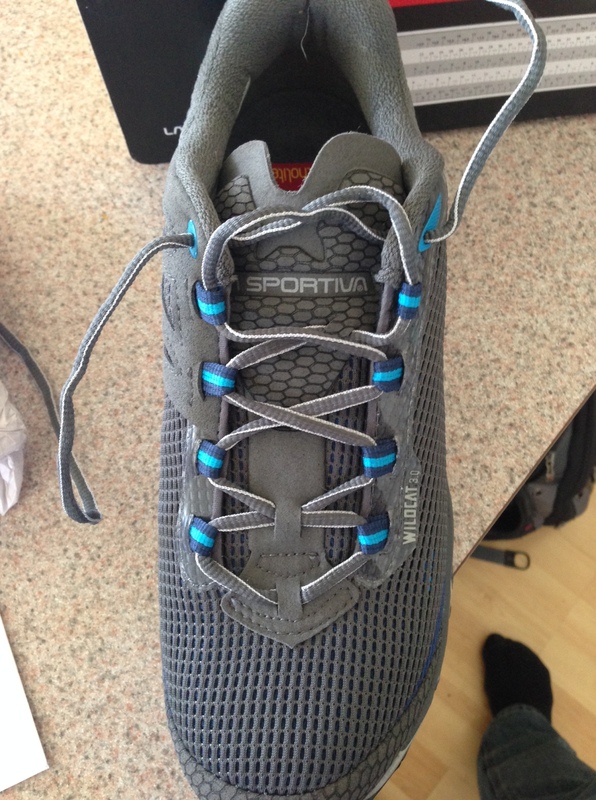 For runners that love La Sportiva, but wish they had a little more room in the toe box, you will like this shoe. This definitely has the roomiest of all models that I have run in. The biggest complaint about this shoe will be the weight, which will likely cause most people to use this shoe as a trainer and go with something lighter on race day. It will depend largely on how you value comfort versus speed. I think for future versions, it would be advantageous for La Sportiva to find a way to trim about an ounce so that they fall more inline with other cushioned shoes on the market. Some people will have issues with the steep 12mm heel-to-toe drop. Personally, it doesn’t bother me that much, but I still would prefer something in the 8-10mm range. To do this, they would likely have to find someplace else to trim weight in the shoe. Still, adding another 2mm to the forefoot would be awesome for a cushioned shoe. As I mentioned, I was surprised with this shoe on a number of occasions, all in positive ways. I wouldn’t say that I had low expectations, but instead that the shoes simply performed beyond ideal in many aspects. While I adapted nicely to the weight of the shoe, most people will simply find it a bit heavy for their taste. As such, for a broader audience, I highly recommend this shoe as a trainer on terrain ranging from smooth to technical. I will also recommend it as a long distance shoe for anyone willing to sacrifice a bit of performance for superior comfort. Whether I do end up using the Wildcat in the Speedgoat 50K or not, this shoe definitely now has a place in my lineup. 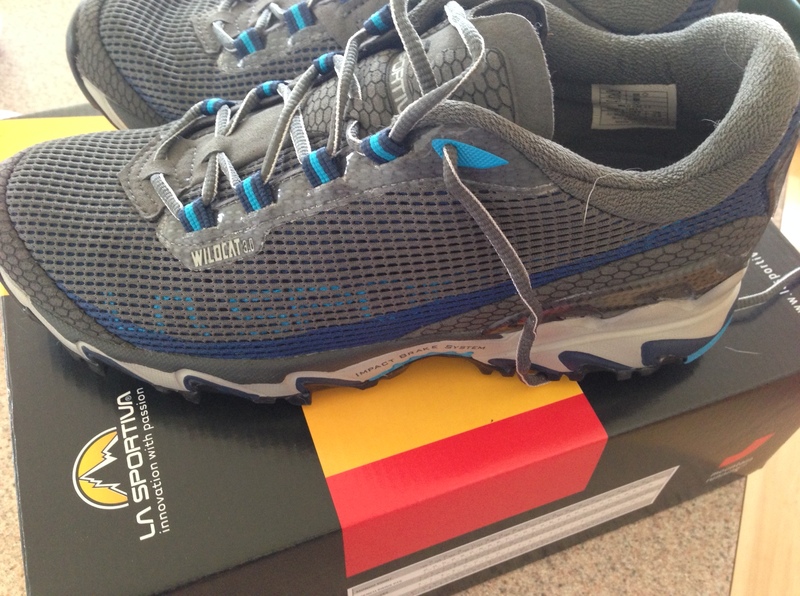 This entry was posted in Gear Reviews and tagged La Sportiva, shoes, trail running, Wildcat 3.0 by Ultrarunner Joe. Bookmark the permalink. Hey Joe, great review. Sounds like the Wildcats are similar to Cascadias. Do you have any experience with the Brooks Cascadia lineup, and if so could you describe the differences? Tim, surprisingly, I have not run in the Cascadias although I have heard them described similarly. The one thing I will say though about La Sportiva is that in my comparisons with other brands, their outsoles are some of the most grippy I have ever seen (like attributed to their background in climbing gear). I love the outsoles on Raptor and WildCat. Are there ANY shoes at all with better grip? I really would like to see a good, thorough, objektive test on that. Has it been done? I think it would hard to do that type of review with all of the different types of shoes out there, but I will say that in my experience it is definitely one of the better outsoles. I actually really like the outsold on the Helios as well. I appreciated this excellent review. I recently gave up my tri-weekly hikes in the Blue Hills of Massachusetts because I have multiple foot problems (very narrow feet, high arches, ligament injury, an extra “accessory” navicular bone, and feet of different sizes) which were seriously aggravated by every pair of hiking boots I tried. I am now wearing minimalist shoes on a daily basis, but limiting my precious time in the woods to moderate hikes/ walks. I know that I cannot return to serious hiking without an exemplary pair of shoes. One of my hiking friends recommended this shoe, which she has been hiking in for a while. Your review gave me hope that this shoe might help me transition back into serious hiking. Thanks very much.